From 23-25 June 2014, in Dar es Salaam, Tanzania, ASLM hosted the “Consultative Meeting on Improving Access and Increasing Quality of HIV Testing in Africa”, in collaboration with the Joint United Nations Programme for HIV/AIDS (UNAIDS), World Health Organization Regional Office for Africa (WHO-AFRO), the US President’s Emergency Plan for AIDS Relief (PEPFAR), USAID and the US Centers for Disease Control and Prevention (CDC). The meeting convened about 80 participants from partner organisations and Ministries of Health, who gathered to exchange experiences and provide structured feedback on current efforts to improve the quality of and access to HIV-related diagnostic testing, particularly at the point-of-care in resource-limited settings. Next steps and way forward. Globally, only about half of people living with HIV know they are infected. Sub-optimal use of high-quality HIV diagnostic tools is one factor preventing adequate antiretroviral coverage and viral suppression. Thus, assuring access to high-quality HIV diagnostics is essential to ending the AIDS epidemic. Moving forward in the fight against HIV/AIDS, countries and partners are establishing new targets for diagnosis, antiretroviral treatment and monitoring. To optimise and extend HIV diagnostic and treatment capacity across Africa, stakeholders must invest in and strengthen technologies, laboratory networks, quality management systems and human resources. ASLM CEO Dr. Tsehaynesh Messele represented the Society at the meeting, stressing the importance of the ASLM2012 Ministerial Call for Action and the ASLM2020 strategic vision. The ASLM2020 vision comprises four strategic areas including laboratory accreditation, national and regional regulatory environments, a network of National Public Health Laboratories, and laboratory workforce development. Dr. Messele expressed her hope that the consultative meeting would result in the adoption of new HIV testing guidance documents and policies, in addition to allowing participants to build consensus on innovations and best practices in HIV diagnostic technologies. 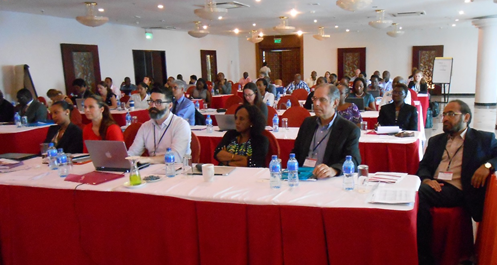 The meeting report for the Dar es Salaam “Consultative Meeting on Improving Access and Increasing Quality of HIV Testing in Africa” can be found in the ASLM Meeting Reports.